Nassim Haramein (b. 1962) is a Swiss amateur physicist. He claims to have developed, in collaboration with academic-but-fringe physicist Elizabeth Rauscher, a Unified Field Theory that he calls the Haramein-Rauscher Metric. Elizabeth A. Rauscher is an American physicist and parapsychologist. She is a former researcher with the Lawrence Berkeley National Laboratory, Lawrence Livermore National Laboratory, the Stanford Research Institute, and NASA. In 1975 Rauscher co-founded the Berkeley Fundamental Fysiks Group, an informal group of physicists who met weekly to discuss quantum mysticism and the philosophy of quantum physics. David Kaiser argued in his book, How the Hippies Saved Physics that this group helped to nurture ideas which were unpopular at the time within the physics community, but which later, in part, formed the basis of quantum information science. Rauscher has an interest in psychic healing and faith healing and other paranormal claims. According to Haramein, this "metric" is a new solution to Einstein's Field Equations that incorporates torque and coriolis effects. He is also the founder of the Hawaii Institute for Unified Physics and the Resonance Project, a website and foundation addressing his unified physics. Try to have a look at the website. It sounds very professional, right? But here you ought to be aware of Haramein as a pseudoscientific storyteller consciously using online medias to spread stories. We will go into this as the article progresses. Apparently he doesn't even get his stuff onto arXiv (Cornell University Library). A number of authors have voiced concern over the lack of transparency in the arXiv academic peer-review process. Philip Gibbs pointed out that moderators can reject papers for a wide range of reasons in a closed process where often the justification for rejection is not given. Gibbs further states, "I used to wonder why so few references to papers on viXra appeared on arXiv until one author forwarded me an e-mail from an arXiv moderator in which he was asked to remove a citation of a paper on viXra to allow acceptance of his submission." Further controversy characterizes arXiv as a shadow journal. Demetris Christopoulos from the National and Kapodistrian University of Athens likens arXiv to a non-declared Journal without a known editor in chief, without a specific written policy regarding submitted papers, and that applies hidden censorship to all papers that do not fall within established scientific dogma. In that connection it is important, as you try to understand all the incredible fake “scientific” material you´ll find on New Age pages, to be aware of an equal amount of fake publishing in such shadow journals (see the Matrix Dictionary entry on Predator Open Access Publisning). On the internet you´ll hear a lot of stuff about Haramein and his published papers. You´ll hear that he has won prizes, and has been nominated for the nobel prize. The nobel prize we are still waiting for. His claim to fame is of course his ”Award Winning Paper” on the Schwartzchild Proton he claims was awarded to him by the University of Liége. Under closer scrutiny, however, the truth is not so cut and dried: This award was not sanctioned by the University at all, rather it was awarded by the participants of a conference held at Liége. Moreover, the participants in the conference were not even physicists! So this award was not prestigious at all, but rather a diploma for attending a conference in Liege, as these participants had no authority to grant him this award. Concerning prizes, it is also important to notice that there also are pseudoscientific shadow institutions that give prizes for the work of pseudoscientists. Everything is possible on the internet. As with fake published papers, you also ought to be awre of fake titles (see my Matrix Dictionary entry Diploma Mills). So, you will hear him being backed up by an enormous amount of very scientific sounding websites and articles, which credibility is highly questionable when looking closer at them. If you look closer you´ll soon find out that all scientists who has knowledge within the fields all see Haramein as a scam. But you´ll also hear his supporters say that the critique is due to a conspiracy, which seeks to suppress the truth, or that it is due to what happens during a paradigm shift (see my entry on Bridge Between Science and Spirituality). You´ll hear expressions such as “cutting edge science is commonly being censored or ridiculed by a more rigid, dogmatic and closed scientific culture.” Such critique is inspired by the postmodern intellectualism behind New Age (see my article Constructivism: the Postmodern Intellectualism behind New Age and the Self-help Industry). Anyhow, if you want to be fooled, it´s up to you. Personally, I wouldn´t like to spend my entire life living in an illusion imposed by some fame-seeking New Age pseudoscientist, just because of wishful thinking. Wikipedia articles about Haramein have been repeatedly deleted. On the above description of Haramein on his website you can see that his name (the two first words of the description) is still linked to a non-existing Wikipedia page (the date of writing this, that is). Like Robert Lanza Haramein seems to be very interested in having his name on Wikipedia. Unlike Robert Lanza he hasn´t figured out Lanza´s trick of creating his own Wikipedia page which only figures on his own website, complete with the Wikipedia logo – have a look – Lanza also has a theory of everything, though his theory is focusing on Biology, and not physics). But the most obvious reason why Wikipedia´s article has been deleted could be that Haramein has had people (followers) to write the articles, and that outsiders have contributed with critique (because that´s a part of how Wikipedia functions). Either Wikipedia itself has deleted it because of the insiderjob, or Haramein has deleted it due to critique. But I don´t know. This is just guesses. The fact is that Haramein refers to a Wikipedia page that doesn´t exist. 2) and at the same time, he claims to have insights into the problems that the top physicists in the world are currently working on, and to be solving fundamental issues in physics. For me, anyone who can do both these things – whether it is deliberate or not – is acting irresponsibly and is misleading people. Surely if anyone is suggesting such a view of Haramein, and giving sound reasons for it, it should be taken seriously. Is he blind enough to actually believe he's proved something, or is he deliberately misleading? I don't know. It´s really puzzling me. Because there is no doubt that Haramein is a very talented communicator. It's clear that he's learned some very interesting facts and is eager to share them. But there are some very serious questions about his understanding and his integrity. Since he obviously has learned a lot of things, how can he at the same time misunderstand the most basic ideas of physics, which even first year students would know? He for example commit the usual observer fallacy in quantum mechanics, which I will return to. Anyway, if you don´t have an insight into physics and mathematics, you won´t have a chance to look through Haramein´s pseudoscientific house of cards. But! But! To our luck there is a blog called “Up”, which has more insight into mathematics than I, and which debunks the more technical details of Haramein (click here). What I on that background can conclude is that Haramein is a practicing pseudomathematician. Pseudomathematics has equivalents in other scientific fields, such as physics. Examples include efforts to invent perpetual motion devices, efforts to disprove Einstein using Newtonian mechanics, and many other feats that are currently accepted as impossible. Excessive pursuit of pseudomathematics can result in the practitioner being labelled a crank. The topic of mathematical "crankiness" has been extensively studied by Indiana mathematician Underwood Dudley, who has written several popular works about mathematical cranks and their ideas. Because it is based on non-mathematical principles, pseudomathematics is not related to attempts at genuine proofs that contain mistakes. Indeed, such mistakes are common in the careers of amateur mathematicians who go on to produce celebrated results. In general Haramein is, as I claimed, a brilliant psedoscientist. b) Using established terms in idiosyncratic ways, thereby demonstrating unfamilarity with mainstream work in the discipline. Haramein´s Unified Field theory is a so-called “Theory of Everything”. There are incredible many of such. Especially in the pseudoscientific environment of New Age. I have in a philosophical way debunked theories of everything several places. Here I build on the philosophy of Niels Bohr (see my article Quantum Mechanics and the Philosophy of Niels Bohr for a more detailed analysis). But very simply you can say that a theory of everything logical seen not is possible due to the negation-principle, which means that you can´t describe something without implying the negation of it. A theory is a thought, and the thought is limited. It is always determined by what it not is. If something limited tries to describe the unlimited it ends in the thought distortion called Endless Split of Thought. The description will never reach an end, because the end implies the negation of it. You can´t describe the wholeness since the wholeness can´t be put in opposition to anything. You can only describe the parts. Now, let´s try to look at some of Haramein´s pseudoscientific terms. Haramein claims his theory explains the origin of spin, which he defines as a "spacetime torque." He claims that his amendment to Einstein's field equations, incorporating torque and coriolis effects in "'plasma dynamics'" interacting with a "polarized geometric structured vacuum", produces a unified field theory. Further, he and Dr. Rauscher have developed a "Scaling Law for Organized Matter", which characterizes all matter from subatomic to galactic and universal size as various sized black holes. His unified field theory and the fractals associated with this "Scaling Law" are integral to his concept of a "Holofractographic Universe". There's also something in there that uses the real field of cymatics to support his idea of "resonance". Drawing on the aforementioned "Haramein-Rauscher metric," Haramein proposed "the Schwarzschild proton", a theoretical model of the proton in which two black holes "orbit" one another. It may sound impressive, but it's almost entirely inconsistent with experimental observation. Anyone with even a basic knowledge of quantum mechanics knows that classical "orbits" do not apply at the scales addressed in his paper. As mentioned: the blog titled "Up" ran a number of posts debunking the Schwarzschild proton model. The paper describing the model is available for download from his website. 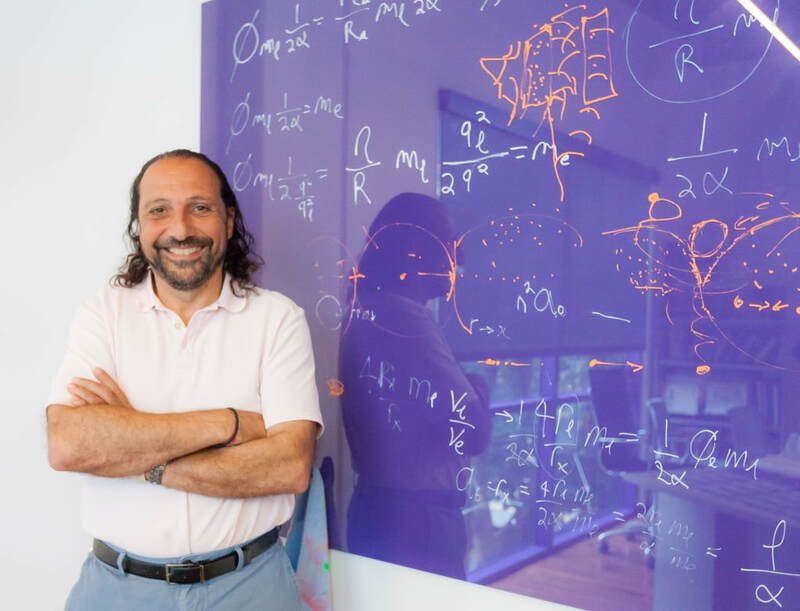 Now that his Schwarzschild Proton paper has been debunked, Haramein claims to have published a new paper, "Quantum Gravity and the Holographic Mass" in the Physical Review and Research International Journal, at Science Domain International. We have already looked at the problem with predator open access publishing, and when we look closer we find out that Physical Review and Research International Journal is in fact not a scientific journal, but an "open peer reviewed" website where anyone can pay a fee and have their "research" "peer-reviewed" and then "published" on the website. In other words: A fake journal. But wait, there is much more to Haramein. Haramein was featured prominently in the conspiracy theory movie Thrive, where he discusses the fundamental shape of the fabric of space, as well as potential extraterrestrial involvement with Earth throughout history. Click here to see the page. On the page you can also see Haramein featured in other Gaia.com productions. In the movie, he addresses the little he understands of quantum mechanics, the phi ratio, tetrahedrons, symmetries in the structure of the vacuum, and, of course, black holes, which, according to Haramein, are everywhere and everything; we are constantly appearing and disappearing at the speed of light, so, half of the time, we are vacuum, made of "blocks" of 64 tetrahedrons, arranged in such a way that a mini-black hole is created right at the centre of each "block", thus proving that we all have four sides. Besides the mathematical debunk on the “Up” blog, then Haramein can, just like all the other quantum mystics of the Matrix Conspiracy, very easily be debunked from a philosophical point of view. This happens already from the very beginning, because he, as mentioned, commits the usual observer fallacy in quantum mechanics. That the observer fallacy in fact is a fallacy is not a subject of discussion, since it can be directly demonstrated. The simple version of the fallacy goes on that the observer in quantum mechanics is the human senses, consciousness, thoughts, or brain, which effect the observed. This is not the case in quantum mechanics (of course we know that in our daily lives our thoughts can effect the observed – we can think and then act so that the observed is effected). But in quantum mechanics the observer, or the subject, is the experimental devices used to measure the observed. And yes, each device shows different things, and highly strange things, when compared, but they do this unambiguously due to how the device is constructed. So, it is not the consciousness of the physicist (the subjective), which makes the electron behave like a particle or a wave. It is the macrophysical (material) experimental devices, which affect the electron in a certain way, so that you unambiguous know, that if you work with this type of apparatus, then it will always behave like a wave, and with another type of apparatus, like a particle. This is actually something anybody ought to be able to think, since you know you can´t observe phenomena on the atomic level with your eyes alone (see the full explanation in The Matrix Dictionary entry Observer (in Quantum Mechanics). That Haramein in fact is committing this fallacy shows that he doesn´t even have the basic knowledge of quantum mechanics. This is something even first year students in quantum mechanics will know. In style with all the other quantum mystics he therefore has borrowed his “knowledge” from other quantum mystics, who commits the same fallacy. On this fallacy he is then building up his whole house of cards by inventing all kind of pseudoscientific terms taken out of the blue air. In that way the whole thing sounds extremely profound, technical and scientific. But by committing the observer fallacy already from the beginning, his whole house of cards falls together, including all his books and workshops, etc., etc. The puzzling issue here is, as mentioned, not so much that he got something wrong, but that he is, with all his obvious knowledge about mathematics and physics, capable of presenting a theory in all seriousness that gives results that are so far from reality without even stopping to notice. If you're trying to present a theory that's supposed to represent reality, surely you would ensure that you (a) understand what your answers mean, and (b) take every opportunity to compare them with the real world? But Haramein´s pseudoscience goes far beyond the difficult pseudomathematics and quantum mysticism. In his DVD box set, Haramein discusses, in addition to his unified field theory, topics including the Ark of the Covenant, the Knights Templar (see my entry on The Priory of Sion Hoax), Emmanuel's Tomb, Kabbalah, and something he calls "the Tree of Life Decoded". In at least one lecture, Haramein claimed to decode crop circles. Haramein is therefore a favorite on Gaia.com, which is overfilled with pseudo-scholarship. Gaia.com brags about their open-mindedness and the closed-mindedness of the established scientific community. But there's nothing open-minded about hanging on to a theory that's WAY outside anyone's common sense, just because you really like it or you really like the person (or community) who told you it or you felt a spiritual response to it. If you want to know about cosmology or particle physics, go and find out about them. If you think you can do better than the scientists out there working on them, go and do it, instead of filling the internet with stories about it. Such stories will, as shown, be debunked. If not, just let go, and accept that there are things you don't know. To people who don´t agree with me, tell me why. Please lay off the "I don't understand any of the physics but I just know in my heart that what Nassim is saying is “true” business. I've heard that far too many times already. If you think any of the facts that I'm giving are wrong, tell me why. And tell me why the facts are wrong, not how you think you can read my motivations from thousands of miles away. The facts are there. If they're correct, deal with it. If they're wrong, explain it.